Do You Know That Retaliation Is not Just Unethical, It's Illegal? Retaliation is an act of revenge or reprisal. Retaliation among friends means getting even because someone flirted with your boyfriend—which is not all that serious. But, retaliation in employment and the world of Human Resources has a much more specific meaning and connotation. 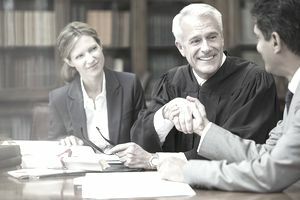 In connection with charges of discrimination, retaliation is a serious issue for employers. An employee or applicant is protected by law from retaliation whether his or her charges are proven true or false. This is to preserve and protect their rights and to encourage employees or applicants who experience discrimination (or retaliation) to come forward and report it. Retaliation can be stealthy and difficult to witness and document. Therefore, it is the obligation of the employer to regularly follow up with any applicant or employee who might face retaliation as a result of the reasons stated above. The employer would be wise to document the regular follow-up and any charges of retaliation that are reported or witnessed as a result. Employers must investigate a charge of retaliation, and even a rumor of retaliation, and document the investigation, its findings, and any disciplinary action that resulted. Following the investigation, the employer still has the obligation to continue to follow up to ensure that retaliation is not occurring. This followup can tax an employer's resources because talking to a complaining employee may not be enough. It is the employer's responsibility to also examine the environment in which the employee is working. A manager is charged with scheduling all employees to work shifts. Employee schedule requests are honored by the manager when she or he can accommodate them. In one case, Steve complained to HR that the requests of black employees are considered last, if at all. He feels that he and other employees of color receive the poorest schedules and that their work-life needs are not considered. HR investigates his complaint and concludes that the manager appears to favor white employees in scheduling per their requests. HR interviews other black and Hispanic employees who agree with Steve and can find no employees who disagree. The employees are not informed of the outcome of their complaint because of employee confidentiality, but the manager is counseled and warned by his immediate manager and HR. Letters are placed in the manager's personnel file and the manager understands that further discriminatory actions will result in progressive discipline that will include termination. His manager and HR attempt to place him in another area of the organization, but nothing at his level is available. So, with severe warnings about his future behavior, he returns to his management position with scheduling responsibility. A month later, Steve returns to HR with a further complaint. The manager has changed his behavior toward all non-white employees except him. Steve continues to experience discriminatory behavior and the manager has taken his behavior a step further. Steve believes the manager goes out of his way to make sure that he has the worst schedule. Additionally, he now treats him with disdain, fails to respond to his written requests, ignores him in the office, and has discussed him with other managers. Coworkers have kept him informed of what they hear. Steve charges the manager with retaliation for his report of discrimination. Another investigation is pursued by HR and the manager's employment is eventually terminated as a result. HR and the organization again responded appropriately to the employee's charges. In this day and age of rapidly rising discrimination lawsuits, it behooves an employer to cover all bases with wisdom, understanding, and ethical behavior. When an employee charges a manager with discrimination and then retaliates to punish the employee, HR is legally obligated to officially and thoroughly investigate the charges. While not all poor managerial behavior amounts to discrimination or retaliation, managers have been known to harass and treat employees unfairly.